In most of the world, the majority of cancer patients are in advances stages of cancer when first seen by a medical professional. 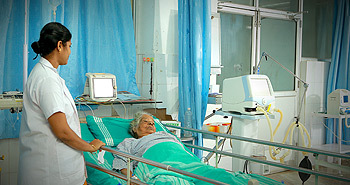 For them, the only realistic treatment option is pain relief and palliative care. Effective approaches to palliative care are available to improve the quality of life for cancer patients. Palliative care improves the quality of life of patients and families who face life-threatening illness, by providing pain and symptom relief, spiritual and psychosocial support to from diagnosis to the end of life and bereavement. With this motto, a team of doctors, nurses and social workers stepped forward voluntarily for this palliative initiative. They are going to the community where the cases are identified by the nursing staffs who are trained in this palliative care programme. The identified cases were given special attention and those who need hospice care are referred to the Trivandrum Institute of Palliative Service (TIPS). Now we are in the move to start the hospice care in our medical college itself.